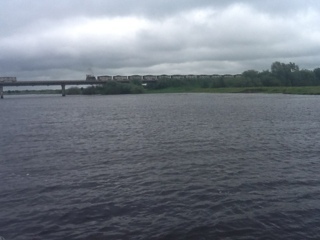 Its a calm cloudy, dry and mild day at Shannonbridge. This should be the final day of our adventure, the day we complete the triangle of Grand Canal, Royal Canal and Shannon. Shannon Harbour is only an hour or so cruising from Shannonbridge. I thought we would have a final leisurely day, but the pressure is on to get to Shannon Harbour as soon as possible as Claire has discovered she has to return to Dublin quickly. This stretch of the Shannon was winding and quite lazy and we drifted into a semi meditation letting Kenmore find its own course. 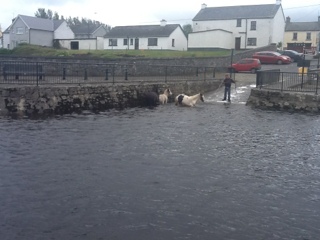 It was somewhere along here that John Roche and family were moored and wrote, "The homely sound of the milking can in action reminded me that fresh milk improves a breakfast. Under the old walls a young girl sat milking her cow. She's given my heart a pinch. Her name was not Kitty Lynch, but still her form was graceful and tender. She gave me the milk, warm from the cow, and refused, in her soft western accent, any offer of money". 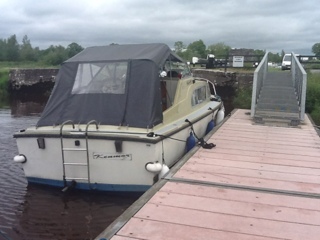 1:15 pm, we arrived at Shannon Harbour, the completion of our Grand Canal, Royal Canal, Shannon adventure. Waterways Ireland would not let us through the locks to moor at Shannon Harhour as it was very busy due to weekend festivities here, a heritage boat rally. Luckily, one boat was leaving so it gave us mooring space just before the lock. From here we started a boat clean up to make it ready to pass over to the owner. As we scrubbed the decks various heritage boat owners and captains arrived to congratulate us and shared tea and scones. 6:00 pm, we locked up the boat for the last time, hauled our luggage to the taxi, and said our farewell to Kenmore ... and the Waterways of Ireland for awhile.